You can heat and cool your home with an energy saving geothermal system, and get free hot water to boot, for much less money and energy than you’ll pay for traditional heating and air conditioning. How can you afford not to install one? There must be a catch! The catch is what it costs to install geothermal. Geothermal costs much more to install than a typical furnace or central AC. But the energy savings, over the life of your geothermal system, mean the system will pay for itself within a few short years. You’ll keep on benefiting from your energy saving geothermal system for decades afterwards, without sacrificing your comfort. As mentioned in How does geothermal energy work, in a geothermal heating and cooling system, heat is exchanged between a living area such as a house, and the nearly-constant ground temperature several feet, or several hundred feet, below the surface, using a geothermal heat pump. Energy saving geothermal heat pumps can operate on a single or double loop system. A loop is a system of pipe or tubing that circulates a liquid, and this liquid is used to exchange heat. In a single-loop system, heat is moved between the heat pump, which heats or cools your home, and the energy saving geothermal heat source or sink, which provides the heat to, or absorbs the heat from, your home. The heat transfer medium in a single loop system is a refrigerant such as Freon. Single-loop systems are closed loops, meaning the heat transfer medium is sealed inside its tubes. The tubes are normally copper pipes. In a double-loop system, there is a heat pump loop and a geothermal loop. The heat pump loop pulls heat out of the geothermal loop and into your home when the heat is on, or dumps heat from your home into the geothermal loop when you are cooling your house. The geothermal loop transfers heat between the heat pump loop and the geothermal source or sink. The heat transfer medium in the heat pump loop is again a refrigerant such as Freon, and the pipes are copper. The medium in the larger geothermal loop is either a mixture of water and antifreeze (closed loop) or ground or surface water (open loop or closed), and the pipes are usually polyethylene plastic. In an open loop system, either ground water or pond or lake water is pumped into the geothermal loop. Heat is exchanged between the geothermal and heat pump loops, and the water is then discharged back into the ground or the pond or lake. Open loop systems are always double loop systems. 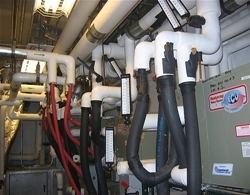 In a closed single loop system, also known as a direct exchange or DX system, the refrigerant travels into the geothermal heat source or heat sink through a network of copper tubing, so that the heat exchange with the source or sink takes place in one step (directly through the copper tubing). Installers of DX systems claim they are more cost effective and more energy efficient. However there are risks and long-term failure concerns with these systems; see below. In a closed double loop system, the refrigerant loop extracts heat from, or discharges heat to, the secondary water and anti-freeze loop where the heat pump is located, typically the house basement. The secondary loop circulates the water down through underground tubing where heat is exchanged with the ground heat sink or source. In a vertical loop layout, one or more holes are drilled deep into the ground (as deep as 300-600 feet). Two lengths of pipe are affixed to a U-shaped elbow which is then lowered into the hole. Successive lengths of pipe are attached until the bottom of the pipe reaches the desired depth. Vertical sections in different holes are then joined in parallel so that the heat exchange medium flows evenly through all of them. In a typical residential installation, a single vertical loop is sufficient. If there is not enough space to install a horizontal loop but there is enough space to drill vertical holes for several loops, the configuration will wind up looking something like the image shown at right. Otherwise, there may be a single loop going deep into the ground. In a horizontal loop layout, a series of pipes are buried either each in their own trench, or several lengths in a single trench. The trench is typically around 4 to 6 feet deep; it must be below the frost line. The depth chosen is a tradeoff between efficiency and cost, as the deeper the coils are placed, the more stable the temperature of the ground will be, but the more expensive the installation will be. In a horizontal “Slinky” layout, flexible tubing is laid down in coils similar to a Slinky toy that has been stretched out. The coils could be configured either horizontally or vertically, but horizontal configurations are more typical. The image at left shows a vertical slinky layout. In a lake or pond layout, flexible tubing is laid out in horizontal coils on the surface of the lake or pond, then the tubing is sunk to the bottom of the water body. The two ends travel underground to the heat exchanger where heat is transferred between this geothermal loop and the refrigerant loop. For groundwater installations you can use the same well to pump the water back into. Water is removed from the bottom of the well, where the ground is hottest, and dumped back into the top. Alternatively, you can pump the waste water into a second well, where it will eventually flow back through the ground; or into a nearby pond, provided you have enough water flow in your groundwater source to keep up with the geothermal use as well as other household and garden uses. Typical requirements for an open loop residential system include at least 2 gallons per minute of groundwater flow, as well as a clean source of groundwater that is low in iron and sulfur. Water hardness can also be a problem. Water hardness or excess minerals can cause deposits in the heat pump or tubing which can cause mechanical failures or reduced efficiency. Open loop systems are typically more efficient than closed loop systems because only one heat exchange occurs, between the refrigerant and water. In a closed loop direct exchange system the heat exchange is between the refrigerant and rock, which has a lower level of heat conductivity, and in a double loop system there are two stages of heat transfer, which also reduces efficiency of heat transfer. Systems using groundwater are ideal for year round heating and cooling because groundwater has a stable temperature year round of around 50F or 10C. There is no geothermal pollution caused by an open loop system, the only change to the water is that its temperature is raised or lowered depending on whether the geothermal heat pump is in heating or cooling mode. Closed vs open loops: which to choose? Is a closed-loop system better than an open loop system? Is a single-loop better than a double-loop? Here are a couple of factors to consider. Energy used to pump heat exchange medium: You’ll use less electricity to move liquids around, if you install a closed loop system. In a closed loop system, you are only expending energy moving water through the pipes. Imagine you are holding both ends of a garden hose with water in it. If you add water to one end of the hose, the water at the other end will naturally rise until the two sides are in balance. In a closed loop system there is no lifting of water required. The potential energy in the water at the highest point in the loop is recovered when that water pushes other water down as it descends. In an open loop system, you pump water out of the ground or water body, then dump it back in. The potential energy in the water being dumped back into the ground or water body is wasted. Environmental impacts of open loops: You are potentially consuming well or ground water in an open loop system. Given that most land areas on the planet are likely to suffer falling groundwater levels due to climate change over the next several decades, you may find that ten years from now your groundwater supply has fallen, and your open loop system may become either less efficient (due to higher energy costs to pump the groundwater up from a lower level) or no longer functional. Zoning or legal impacts of open loops: Make sure to check with your local environmental and zoning authorities before you install such a loop. Although there is no pollution from the discharge of water from your open loop, there may be zoning or environmental regulations that need to be considered. Direct exchange systems: environmental disaster in waiting? While a direct exchange system may sound like a good idea from an economic perspective (cheaper installation, more energy efficient operation) you might not want to consider this option because of the environmental risks and the shorter lifespan of the heat exchange bed. Far more ozone depleting chemicals used: The heat exchange medium going through the ground is the actual refrigerant used in the heat pump (that’s what direct exchange means). This refrigerant was originally Freon, an ozone depleting CFC, but as CFC’s have now been banned globally from most refrigeration applicatoins, it is a follow-on HCFC refrigerant which while less ozone depleting than Freon still has adverse effects on the ozone layer. CFCs, and HCFCs, are benign compounds at ground level but in the ionosphere they can break down the protective ozone layer at an astonishing rate.A direct exchange system can use up to 100 times as much refrigerant as a double loop system. If a major leak were to develop, you would be releasing massive amounts of ozone depleting chemicals into the atmosphere. If a dual loop system were to spring a leak in its ground loop, only water and antifreeze would be released into the ground. The antifreeze solutions used biodegrade fairly quickly and do not pose an environmental risk. Copper pipes corrode more quickly. The copper pipe used in a direct exchange system is subject to corrosion in acidic soils, and therefore leaks can develop easily. In addition it is next to impossible to locate a leak in, orrepair pipe buried in, the heat exchange bed. The existing type of heating system in your house (forced air, water based rads, electric baseboard heat) may determine which type of heat pump you require. For electric baseboard heat, you will need to do major changes to your house, either to install radiators or forced air vents. For an existing forced air furnace being replaced, you would normally install a water to air system, which transfers heat between the source water and the forced air ventilation system. For an existing radiator based heating system, you would choose a water to water system, which transfers heat between the water or refrigerant in the heat pump (depending on whether it is a single or double loop system) and the water running through the radiator system. 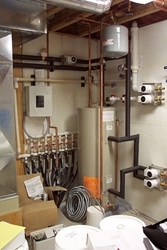 For an existing radiant floor heating system using hot water pipes, you also would choose a water to water system. Hybrid systems also exist which can provide air heating or cooling to forced air systems, as well as water heating for piped under floor heat. All types of energy saving geothermal systems can be designed to provide a portion or all of your hot water. A de-super-heater extracts extra heat from the refrigerant in its gas stage, and transfers that heat to water circulating between the de-super-heater and your hot water tank, so that little or no energy is used by the hot water tank when the heat pump is in cooling mode: the heat you extract from the air can be used to heat your water. During heating season, the de-super-heater may be able to provide some heating power for your hot water. As well, all three types of heat pumps can produce hot water for household use if this is designed into the system. The hot water will generally cost significantly less than a conventional natural gas or electric tank hot water heater or a tankless hot water heater. The energy efficiency of geothermal systems is measured differently for their heating and cooling modes. For heating efficiency, the efficiency of an energy saving geothermal system is known as the COF or Coefficient of Performance, which is the ratio of BTU ouput (amount of heat extracted from the heat source) to BTU input (BTU equivalent of the electricity used as input). ENERGY STAR rated geothermal heat pump systems must have a COF of 3.3 to 3.6 (or greater), depending on the loop type. For comparison, the COF of the best energy-saving electric heaters is 1 (one BTU of electrical energy produces one BTU of heat). The COF of a 94% efficient high-efficiency gas furnace would be 0.94. For cooling efficiency, the same energy efficiency rating is used as for air conditioning systems, the EER or Energy Efficiency Ratio. ENERGY STAR rated geothermal systems must have an EER of at least 14.1 to 16.2, depending on the loop type. Compare this to only 14 for most standard air conditioning systems. It is hard to give precise cost estimates for an energy saving geothermal system because of the many variables involved. How big is your house? How well insulated is it? How hot does it get in your area in the summer, and how cold in winter? What type of energy saving geothermal system is most suited to your location? My own downtown Toronto home: I looked at having a heat pump installed in my 1,300 square foot Toronto home, which is on a 25 x 95 foot lot. The house is old (1920 vintage) but very well insulated for its age. In 2005 I was quoted $25,000 Canadian for a horizontal installation, or $35,000 Canadian for a vertical installation (that works out to $22,000 to $31,000 US). Given the lot size, only a vertical installation was feasible, so $35,000 was what I would need to pay. I did some payback calculations based on what I was paying for natural gas, and even assuming the energy saving geothermal system worked for free, the payback would have been 35 years or more. The US Energy Efficiency and Renewable Energy Office (EERE) estimates an installation cost of about $2,500 per ton (12,000 BTU), or roughly$7,500 for a typical residential unit. Compare that to their estimate of $4,000 for a typical forced air natural gas and air conditioner combination. Other estimates put the cost for a 3-ton system at a minimum of $4,000 to $11,000. My conclusion is that an energy saving geothermal system will cost you between $5,000 and $20,000 assuming you already have a heating and cooling distribution system in your home that is compatible with your chosen system (for example, forced air). So is it worth installing one? If your current heating and air conditioning system is in need of replacement, or is very inefficient or costly to operate, an upgrade to a more efficient system is definitely in order. But suppose it costs you $10,000 to upgrade your oil furnace and air conditioner to an energy saving geothermal system. Your old oil bill might be $2,000 per year, while your new electricity bill for the geothermal system might be $400. You save $1,600 per year. This gives a simple payback of 6.25 years. Sounds great. Go for it! On the other hand, if you currently have a high EER air conditioner and a high efficiency gas furnace (like mine, which is 94% efficient), and install costs are $20,000, the payback period is much longer. I paid $800 for natural gas last year (for both heating and hot water) because of my high efficiency furnace and high levels of insulation and weather proofing. Let’s assume my geothermal costs are only $200 for electricity per year. So I save $600 per year – but a $20,000 investment takes a long time to pay off at $600 per year. 22 years, in fact. Do the math before you install one of these systems. Remember that your options extend beyond keeping your current system and installing an energy saving geothermal system. You could upgrade to another more energy efficient heating and cooling system, or you could invest in energy efficiency upgrades such as insulation and weatherproofing. But if you do decide to install an energy saving geothermal system, by all accounts you will be living in comfort and quiet for a long time. Air exchange heat pumps can be used for both heating and air conditioning. As a source of heat they can be more cost-effective than a forced air gas furnace, and are usually more cost effective than electric heat, provided the winter temperature does not drop too low. In extremely cold climates such as much of Canada, air exchange heat pumps are not suitable. Even in southern areas of Canada where temperatures don’t fall much below -10C, they are still not very efficient on colder days because they are trying to extract heat out of very cold air. Compare that with trying to extract heat out of an energy saving geothermal system with a water exchange cold loop where the water is always at 4C, or a ground based system where the ground temperature of the heat exchange bed is a steady 13C. It’s easy to see how air exchange heat pumps will be less efficient in cold climates than an energy saving geothermal system. If you are thinking of installing an air exchange heat pump, think geothermal instead! I never knew that geothermal heating and cooling systems were so effective in heating and cooling your house without using a lot of energy. To me, a geothermal system seems like a big investment because it is expensive to pay for like you mentioned. However, it also pays for itself in a short amount of time because of all the money that you would save in energy.